Justin Wilson became the 2001 International Formula 3000 Champion at Eau Rouge on the first racing lap of the Spa race, the penultimate round of the series. 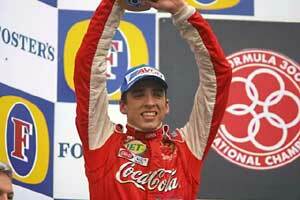 His only challenger was Mark Webber and when the Australian crashed heavily into the barriers, it was all over. The shunt destroyed Webber's Super Nova Racing Lola but the Benetton test driver got away with only a bruised ankle. Wilson did not need to win at Spa and victory in the race went to a tearful Ricardo Sperafico of the Petrobras Junior Team. Spa was its usual complicated self in qualifying for the Formula 3000 race and with the weather conditions changing as the track dried there was an element of chance in the final minutes of the session. 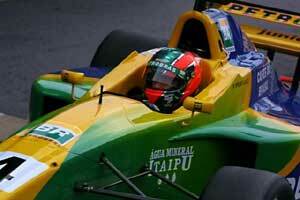 The Petrobras Junior Team got everything right and so Ricardo Sperafico and Antonio Pizzonia ended up 1-2 on the grid. Pizzonia reckoned that he had not made a mistake on his final flying lap he would have taken pole position. Wilson kept things under control to qualify third while his team mate Tomas Enge had a less easy time of it and was down in ninth on the grid, which did not help his chances of beating Webber to second place in the championship. Helmut Marko's Red Bull Junior Team also had things under control and Ricardo Mauricio and Patrick Friesacher were fourth and sixth on the grid with Webber fifth, having slid wide on his fastest run at the end of the session. He had been fastest during the first session but it all went wrong in the final minutes. "You needed to be in the right place on the track at the right time and we weren't," Webber admitted. The remaining frontrunners were Darren Manning (Arden Team Russia) in seventh, with Marc Goossens, who had been drafted in by Coloni, eighth and Bas Leinders (KTR) in 10th. The other local hero David Saelens was down in 17th in his European Minardi entry. On Saturday the track was damp when the Formula 3000 field lined up and the FIA decided that to avoid incidents the race would be started behind a Safety Car. On the grid there was much head-scratching over settings and Webber decided to take a risk and lower the rideheight of the car in order to gain more straightline speed. This would be his undoing. 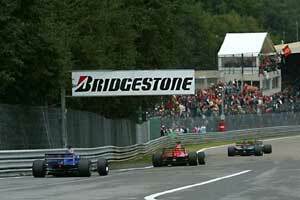 As the Super Nova car went into Eau Rouge at racing speed for the first time (on lap two) Webber lost control. "It is possible that the chassis bottomed out as I went through Eau Rouge," said Webber. "I really cannot be sure because it all happened so quickly. Suddenly I was pointing the wrong way. After that I was just a passenger. I knew it was going to be a big impact, so I just kept my head down and braced myself." It was a huge impact but Webber was able to get out of the wreck unassisted although he was hobbling badly when he left the car. The race director immediately sent out the Safety Car while the wreckage was cleared up and Coca- Cola Nordic Racing informed Wilson that he was now the champion. Wilson is the first British driver to win the F3000 title - now in its 17th year - and the first to win at F2 level since 1983 when Jonathan Palmer took the European Formula 2 title. Ironically Palmer is now managing Wilson. Webber was sent off to have his leg checked over but x-rays revealed no broken bones. The race restarted on the fifth lap but shortly before that happened Pizzonia (who was running second) made a mistake and spun and so dropped down the order to 15th position. 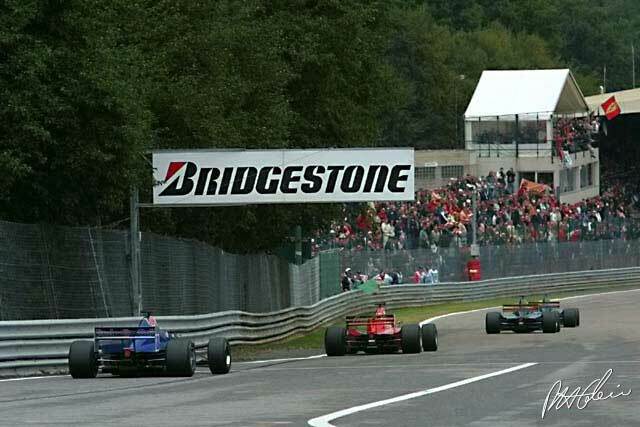 After the restart Manning overtook Mauricio for third with a hugely brave outside pass (almost on the grass) at Kemmel (the fast right-hander on the way up the hill to Les Combes). Further around the lap however Manning hit a bollard and removed his front wing and so he dropped to the back of the field as well. This left Mauricio in a safe third position ahead of Goossens, a fast-starting Enge and Friesacher. Two laps later Enge overtook Goossens while further back on the grid the European Minardi team wiped itself out when Saelens and his team mate Andrea Piccini collided at Les Combes. "I shall be having a word with those," said a disgruntled team boss Paul Stoddart. The remainder of the race offered little interest at the front of the field with the only notable move being Leinders grabbing sixth from Friesacher on lap 17. As the cars completed their last lap heavy rain began to fall and Friesacher lost control at the chicane, ran into the back of Leinders and punted him off. This allowed Sebastien Bourdais (DAMS) to grab the last point. Leinders rejoined to finish seventh with the top 10 completed by Pizzonia, Derek Hill (DAMS) and Friesacher. With one race left Wilson now has an unassailable lead in the championship as he is 26 points clear of Webber and Enge, who share second place on 39 points. Bourdais is no threat to either as he has only 26 points.